BEST LOCATION in Palm Grove - lakefront property, walk to pool and tennis courts, brand NEW A/C with NEW luxury vinyl wood plank flooring throughout. 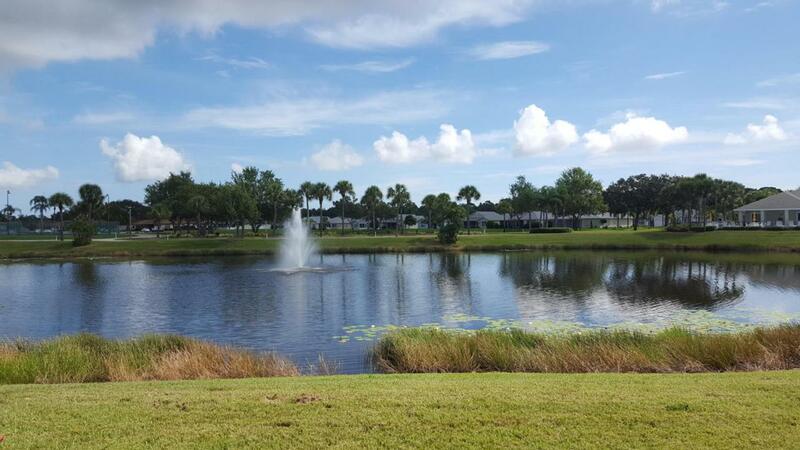 Ready for it's new owner is this 2b/2b freshly painted 1 car garage single family home with BROAD LAKE VIEW in gated Palm Grove, a 55+ community w/clubhouse, pool, baci & tennis courts, shuffleboard, tennis & more! This home is freshly PAINTED inside, boasts NEW wood-grain waterproof vinyl flooring throughout, NEW A/C, and is located so that almost every room has a lake view and is convenient to the clubhouse. With cathedral ceilings in the living & master rooms, sunlight floods the living space. Featuring a formal dining room, sun-filled breakfast room & spacious kitchen, this home offers a comfortable floor plan, accordion shutters, andscreened patio to gentle breezes. Close to shopping & restaurants this neighborhood has an HOA that covers cable, water, sewer, lawn,trash, & security. Screened patio has easy rollup windstorm shutters.